Fire is a component of nature. A regular influence on the health of natural systems. 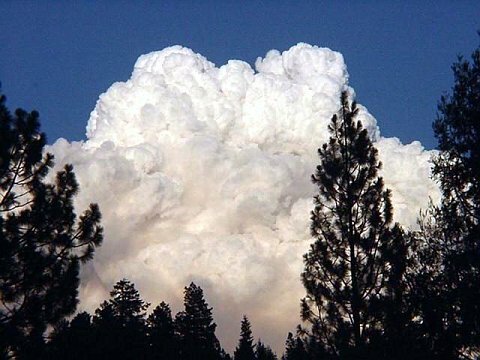 But these raging billows are the fruit of 150 years of fire suppression in the forests...which is very unnatural in the wilds, indeed. The Biscuit Complex Fires consumed better than 500,000 acres. 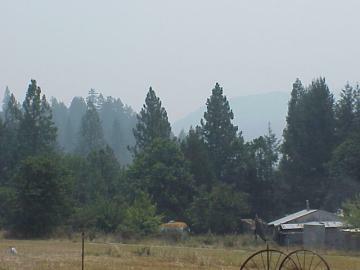 The Tiller Complex fires consumed 70,000 acres during the same period of time. One fire complex to the north of us and one to the southwest of us. 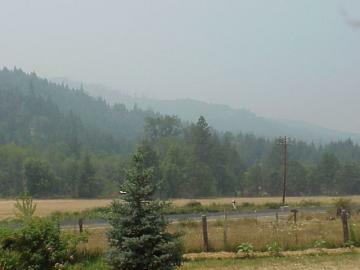 This is a shot from our cottage of the Timber Rock fire complex to the southeast . It was a mere three miles away. The weather was such that each night a canopy, created by a phenomena known as an inversion, covered the fire zone and contained its heat down into the forest. 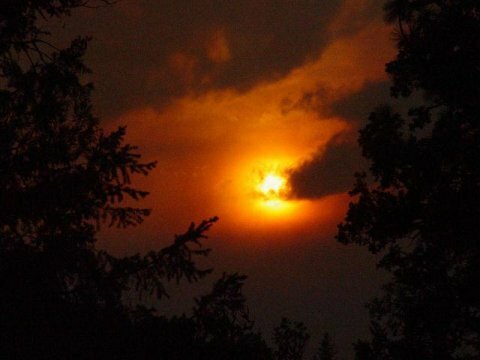 Each morning the “inversion” would lift, and the forest, which had been baking all night in the contained heat, burst into a ball of hell fire. This went on for days and days. The fires raged for several months filling our daily lives with smoke and the possibility of impending doom. The many years of unusually intense drought during the yearly dry seasons was taking its toll. 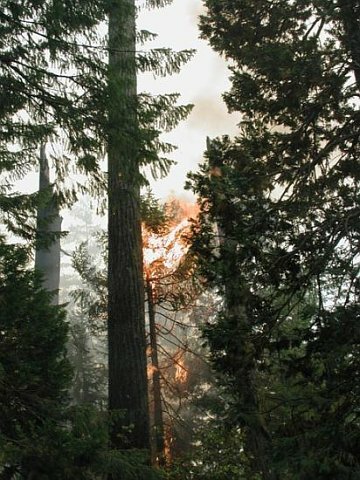 Each the inhabitants of our local village would gather down at the Tiller District Ranger Station to get the latest news of the fires, potential evacuations and assessments of the damage to the ancient old growth forests surrounding us. Day by day the herd is released to the pasture. 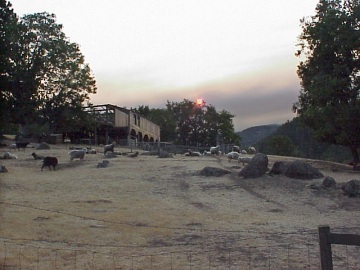 One can not wonder how many thousands upon thousands of wild animals died in the fire. In ancient times low intensity fires burned through the forest at regular intervals. These were caused by lightening or they were caused by the Native Americans to cultivate and maintain their oak tree stands. Did you know that many types of molds, fungi and diseases are destroyed by short durations of smoke exposure to the trees? Many more acorns would be harvested and travel through the thick forests was made much easier. Forests have been managed in this way by mankind in consort with nature for many thousands of years. The eerie pall overhang the mountains and valley's as “Indian Summer” stretched the drought well into the Autumn months. Life went on with the specter of many hundreds of thousands of trees, new and ancient in years, consumed by the hellish tumult ever present in our minds. 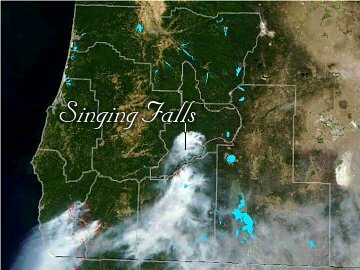 This NASA satellite image shows where the Oregon fires were. 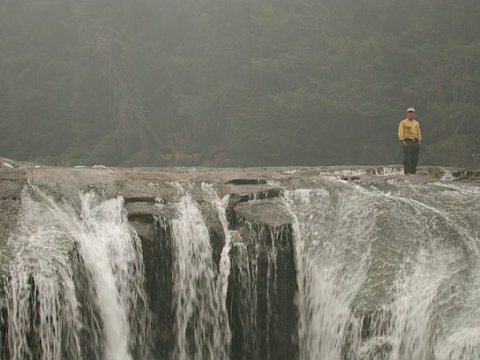 The text in the image points to the Location of Singing Falls. 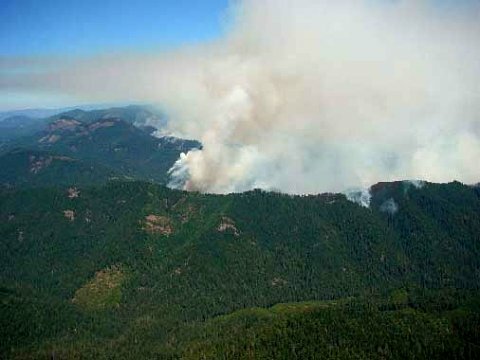 This is an aerial view of the Umpqua National Forest 2002 fire. Our back yard on fire! 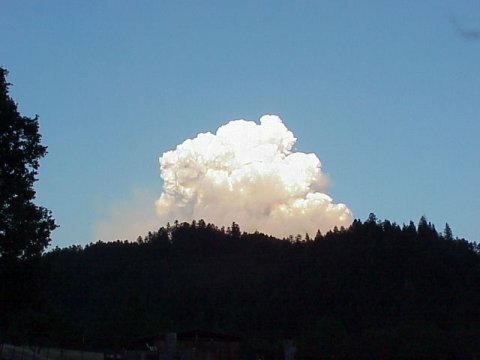 The Timber Rock fire was to our South East. 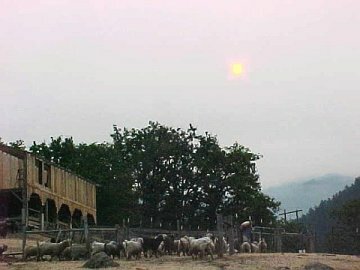 The North Umpqua fire complex was to our North West. It is very challenging to stand by my neighbors house watch the flames leaping on the mountain tops. 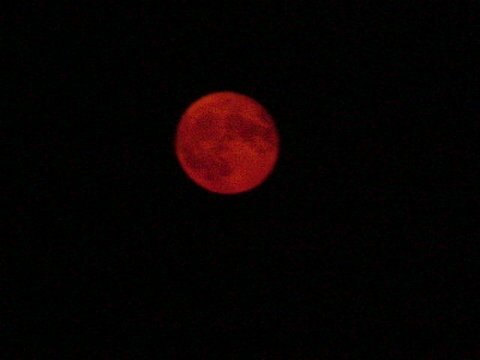 The following series of pictures are courtesy of one of the firemen. Thank you God and thank you firemen for putting the raging inferno to rest. 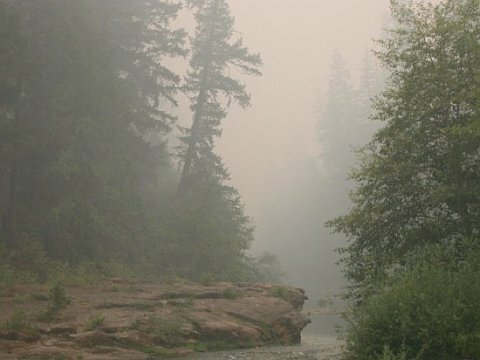 The South Umpqua River enshrouded in heavy smoke as it winds through the old growth forests. The South Umpqua Falls. This is the site of ancient pow wow gatherings of the Umpqua Tribe. These photos show a couple of hot spots located in the thick underbrush. Many of the old growth stands survived. 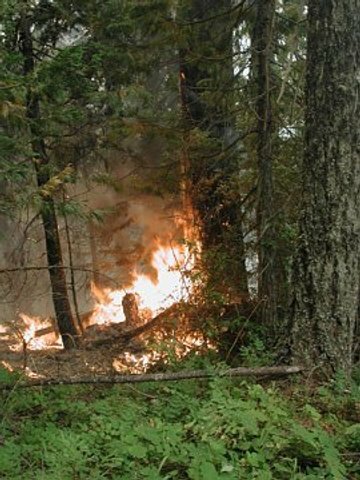 The old growth trees that were located next to plantation stands often died in the fury of the flames associated with the sterilizing heat of young even aged tree stands going up in fire. 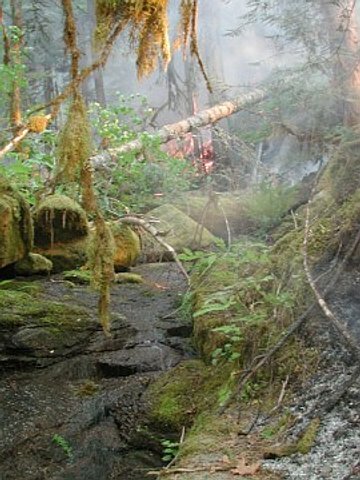 At the peak of the fire it reached 109 degrees Fahrenheit ambient temperature with 25 mile an hour winds. Oh, the fury of hell was unleashed on the forest.